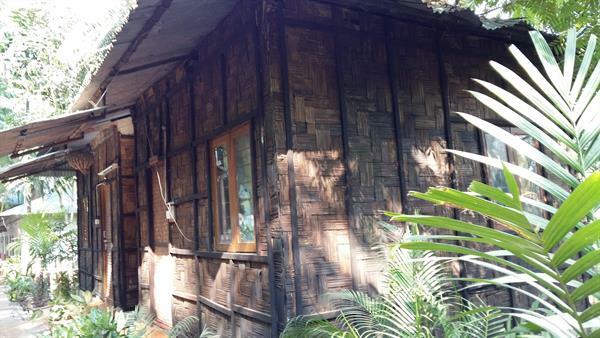 Wondering where to experience a local eco stay in Port Blair? Are you looking for a reasonably priced place, clean and green and with warm and welcoming staff? Then you must book your stay at Palm Grove Eco Resort, Port Blair. You may wonder why I am dead sure about stay at this resort. I booked on my own from Mumbai and without any tour operator or an agent. Read this article about Palm Grove Eco resort location, various types of rooms, the tariff, the facilities and my experience . 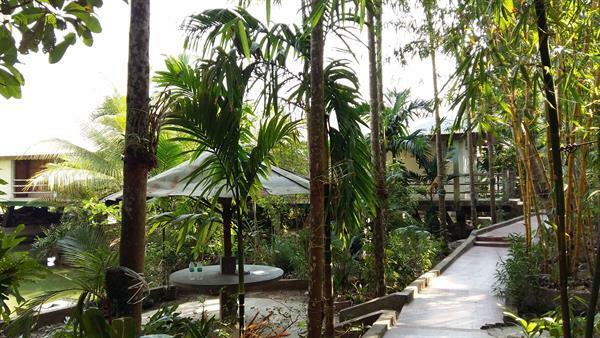 The top ten reasons for choosing Palm Grove Eco Resort are listed here. Award and recognition: Palm Grove Eco Resort has won Award for promoting Eco Tourism in the Islands on World Tourism Day, 2002. Ministry of Tourism has classified the resort in Star Category Hotel. Concept: Only one of its kind resort in the town of Port Blair which has the used eco-friendly concept in the design and construction and maintenance of rooms, dining, and the entire place. Even though the place is located in the seismic zone the resort is safe because the entire construction is quake resistant. Location: Palm Grove Eco Resort isLocated away from the centre of the town and its hustle and bustle in Pothrapur, about 5 km from the airport and 5 km from the only beach in the town: Corbyn Cove. Food: Simple, but tasty food made and served with love and care. Local tour: The staff is very willing to arrange local tours like local sightseeing, herb walk, boating, fishing etc. For whom: Ideal and safe for solo travellers, family and even large groups. Breakfast is a part of the package. About rooms: Rooms in Palm grove eco resort are all on the ground floor, and each room opens out to beautiful greenery and water canal. Rooms are spacious and include air condition, television, intercom, attached bath with hot and cold water, bamboo mats on walls, false ceiling, wooden floor, wooden bed with mattress and pillows, cotton bed sheets. Choose from among the various types of rooms depending on your budget and the number of people. Nicobari cottage: round shaped independent huts on stilts of 4 feet height, tree cottages are partially supported by mango and coconut trees and concrete pillars at 12 feet from the ground, canopy top AC bungalow at about 20 feet from the ground, with open veranda, canal top rooms, and eco rooms adjacent to each other facing the canal. 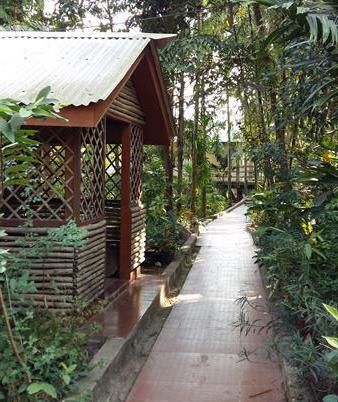 All rooms are amidst the trees and plants and give you a feel of the serene greenery around you. Rules: Palm grove eco resort rules are strictly followed and no tourists are allowed without a photo id. For children below eight, there are no charges. Travel arrangements: Leave the travel worries to the Palm grove eco resort staff. Enquiries are very well handled, on phone and emails. All queries of the tourist are resolved and the tourist is made comfortable even before landing on the islands. The staff go out of the way to assist the tourist in making the entire holiday plan and help in the bookings of ferries and hotels in Havelock, Neil, or other places on the islands. Car and bike rentals: Car rentals are arranged at a reasonable price in Palm grove eco resort. The vehicles are in good condition, with clean interiors and the drivers are very polite, punctual and helpful in resolving the tourist's queries. The resort has also started the facility of bike rentals. The staff will provide you with a local map and explain to you about how to explore the town. The Even helmet is provided by the resort. When I was planning my holiday in the Andamans, a week before the trip I had called Mr Satya, in the resort office on several occasions. He was very cooperative in helping to plan the trip, providing inputs regarding what to see, when to see, about the local attractions and even what to do in Havelock, Neil and Long islands. The inputs proved very useful for the trip. When we landed in Port Blair, the car was waiting and the staff had kept the room ready for us. The environment at the resort was warm and welcoming and hospitable. Our stay was enjoyable and marvellous. If I happen to travel to the Andamans again I am definitely going to stay again in Palm Grove Eco Resort. The reasons above make it worth the stay. Overall the resort has extremely worthwhile valid reasons for choosing to stay in Palm Grove Eco Resort in Post Blair. We had a family trip to Port Blair for a week, We stayed Palm Grove Eco Resort for 3days and 4 nights. It was an awesome experience. Wonderful services were provided by the resort.